Nektan have been one of the most prolific operators in the iGaming world when it comes to releasing online casinos. Hardly a month has gone by in recent memory without at least one, if not several new Nektan sites joining the market, there’s so many now that it’s almost impossible to count them all. This wouldn’t necessarily be a problem if the sites were good, but unfortunately Nektan has developed something of a reputation for prioritising quantity over quality, which has not gone well. Site after site with basically the same look, and the same content, has meant that Nektan has started to feel more like a production line than a creative operator. We have been waiting so long for something even slightly different to appear, that we’d almost given up, but just as we’d lost hope, Play UK appeared on the scene. Now, it should be pointed out that there is still one traditional Nektan issue at play here, in that if you visit another tab on your browser the site shows the words “Hey! Come Back!” in the Play UK tab. This is almost definitely supposed to be a sweet and pleasant touch, but that is not how it comes across. When you consider the fact that protection of vulnerable gamblers is becoming an increasing priority for the industry, calling after players who may be taking a necessary break is not the best idea, to say the very least, and we hope this will be taken away from Nektan sites in the near future. Past that issue though, as big of an issue as it is, Play UK feels like a genuine step in the right direction for Nektan, but is it? 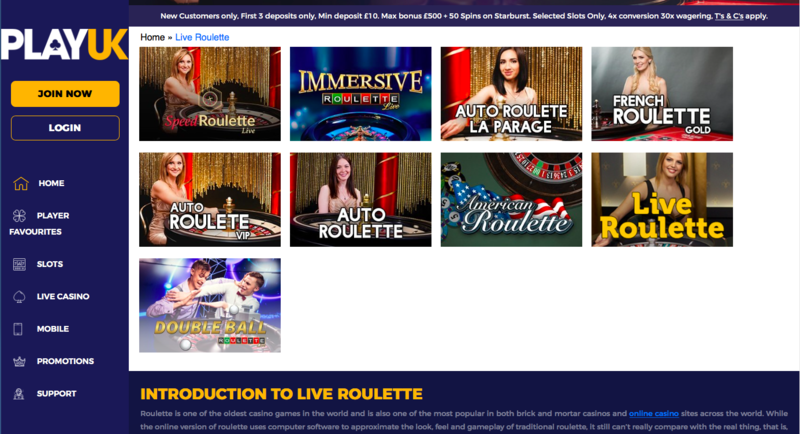 If you can look past the bored looking model in the top banner here, which also advertises the welcome bonus (at the time of writing) Play UK is a much better looking site than any others on the network have managed to be before. A simple yellow and white colour scheme is put together nicely here to create the perfect backdrop to the array of thumbnails that appear on the homepage. Unlike other Nektan sites, that have the same collection of thumbnails in the same order, the images here create a symmetrical design of their own with the colourful design within each thumbnails creating a sense of games-focused artwork that puts the titles on offer to the foreground, something which has proved successful for many sites in the past, although this is the first Nektan site to do it right. In terms of design, Play UK is the first Nektan site we’ve seen that isn’t immediately identifiable as a Nektan site, and that’s a definite positive. 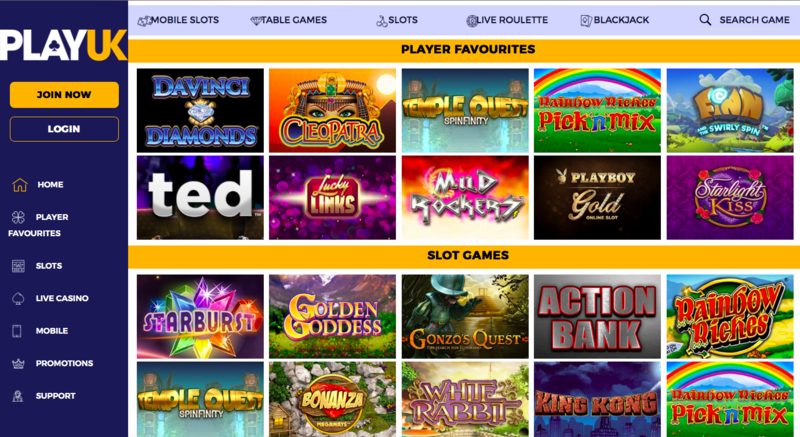 The games selection at Nektan’s online casinos is normally the one redeeming feature the site has, but at Play UK, it is another reason to like this site. With titles coming from the likes of 1X2 Network, Aristocrat Gaming, Big Time Gaming, Blueprint Gaming, Core Gaming, edict egaming, ELK Studios, Evolution, Extreme Live Gaming, Felt, Gamevy, IGT, IWG, Microgaming, NetEnt, NextGen Gaming, Realistic Games, Red Tiger Gaming, SG Digital, SG Gaming, and Williams Interactive, with Nektan’s proprietary software thrown in as well if you like that sort of thing, there is a very good collection on offer here. Whether you’re into slots, table games, or that live dealer experience, this site has something for everyone, and quite a lot for most people! Play UK is a huge step for Nektan, who have gone from creating boring, identical sites, to creating something very good here, we hope this is a sign of things to come.